If you have ever stepped foot into an outdated restaurant, you know just how offputting worn flooring can appear. Your restaurant’s interior speaks volumes about your business, and as such, you want to maintain a presentable facility for the satisfaction of your guests. But how can you make your flooring shine when many flooring solutions do not hold up against years of wear and tear. With the simple use of epoxy flooring, maintaining a presentable restaurant is now easier than ever. That’s why, in today’s article, we will be taking a look at why epoxy flooring is suitable for your Florida restaurant. If you are a restaurateur located in Orlando or the surrounding areas of Florida, get in touch with PPI Floors today. As the industry leaders in epoxy flooring, we possess the proven tools and knowledge necessary to ensure that your newly installed epoxy flooring is as breathtaking as your restaurant’s interior. With a number of topcoats to choose from, we make it easy for Florida restaurant owners to find a flooring system that exceeds their expectations. Learn how your restaurant can benefit from epoxy floors by reading more on the subject below. Slip-and-fall accidents are incredibly common in the workplace. Not only do slip-and-fall injuries compromise the wellbeing of your staff, they can also cost you a significant amount of money in workers’ compensation claims. Instead of leaving your business susceptible to lost profits, consider investing in a high-quality epoxy flooring solution that offers anti-slip properties for the most in customer and employee safety. The food industry is messy by nature. With constant spills and cleanups that must be tended to, you want to make sure that your floors can withstand the constant wear and tear that comes with a thriving restaurant. This is one of the many reasons why epoxy flooring is more than suitable for the foodservice industry. Epoxy topcoats help to protect your underlying concrete flooring from becoming stained, and make cleaning up spills effortless. Your restaurant’s kitchen is no stranger to excess moisture. Warm, damp environments such as a restaurant kitchen are prone to bacteria, mold, and mildew buildup, which can be incredibly dangerous for both employees and customers. Instead of risking a foodborne outbreak at your restaurant, consider installing epoxy flooring in your kitchen. Epoxy flooring possesses anti-microbial properties that make it incredibly resistant to invasive bacteria. By using epoxy flooring your restaurant’s kitchen, you can ensure the most in safety for your staff and guests. 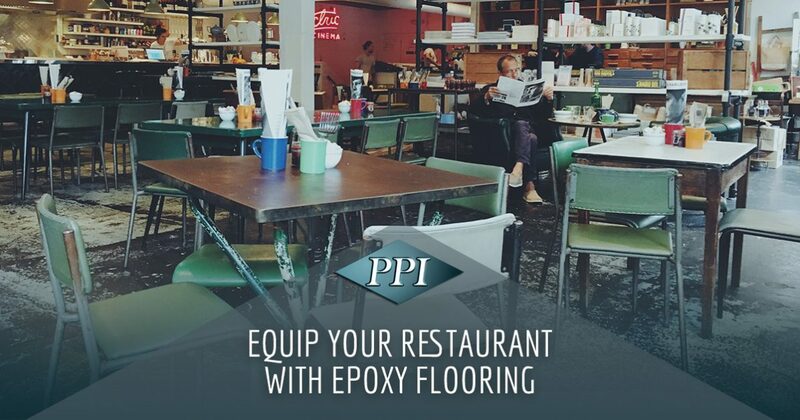 If you are interested in receiving a no-obligation, no-hassle project quote for your Florida restaurant, get in touch with the epoxy flooring installation experts at PPI Floors today. With more than 25 years of experience in the epoxy flooring industry, we know that you will be pleased with our attention to detail, timely installations, unfaltering commitment to you, the customer. If you would like to learn more about our wide selection of flooring materials, visit our website today or get in contact with one of our friendly flooring professionals!